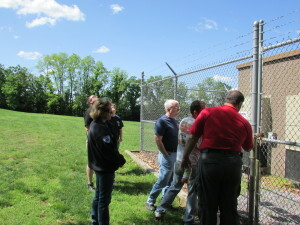 On May 31, 2014, we conducted a Tower Safety and Rescue Awareness class at West Hempfield Fire and Rescue in Lancaster County. Students spent over three hours learning about how the tower industry handles emergencies, RF safety, site safety, and then we conducted a site survey of an actual tower site to help bring it all together. A great time was had by all from the feedback received. 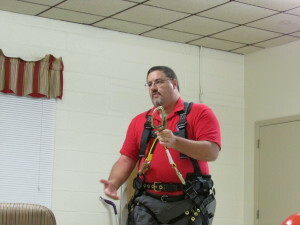 Alex demonstrating a climber’s full-body harness with a positioning assembly. Alex pointing out the tower owner contact information and FCC registration data that is important to know when dealing with a site emergency. 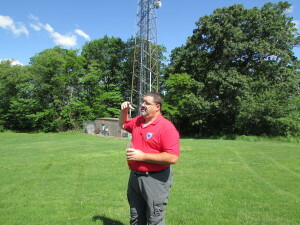 Alex discussing some of the types of RF (radio frequency) danger present on this tower.